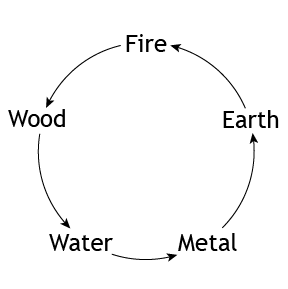 The Five Elements, Wu Xing in Chinese, means the Five Transformations of Energy or the Five Movements. 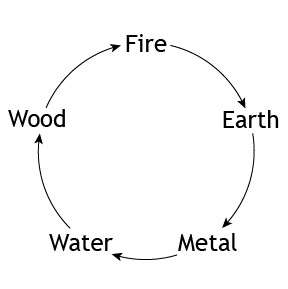 The Five Elements are five types of Qi : Metal, Water, Wood, Fire, and Earth. 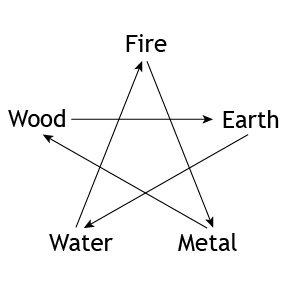 They are different from the five elements of Greek metaphysics which are Fire, Earth, Air, Water and Ether. All energy can be classified in one of the Five Elements. These Five categories represent the interaction of the forces of nature. All elements have a productive, a weakening and a controlling cycle. However, it is important to understand that each one of the three Cycles has its own purpose and significance.